"Both of my children played in multiple EYCP seasons. I credit EYCP for helping them become better musicians and performers. Playing in EYCP was one of the best experiences for my children. Two thumbs way up!" The Emory Youth Chamber Program (EYCP) provides intensive small ensemble training to young Atlanta-area pianists and string players. Students are generally 10-18 years old** and are placed in groups of two to five musicians. Over the course of the semester, groups receive eight coachings from members of the Vega Quartet and are also provided space at Emory University for independent rehearsals, which generally take place on Sunday afternoons. At the end of the semester, groups give a public performance to share their work with family and friends. **Advanced students under the age of 10 who wish to apply are encouraged to write to vega@vegaquartet.com, to be advised on a case-by-case basis. A cello quartet (l-r: Evan Nicholson, Mingdao Gavalda, Jordan Leslie and Will Goodwin) perform on the December 2016 concert. Applications for Fall 2018 are now closed and auditions have been completed. If you would like to be considered for the Spring semester, please email vega@vegaqurtet.com by January 1st to discuss an application and audition. To learn more about ECYP, please click here. EYCP students participate in a masterclass once a semester, performing for peers and colleagues. EYCP was founded in 2006 by the Vega Quartet, Emory University's Quartet-in-Residence and the first and only professional string quartet based in Atlanta. The Vega is an international award-winning Quartet with an active concertizing career and more than 15 years of experience in teaching chamber music. 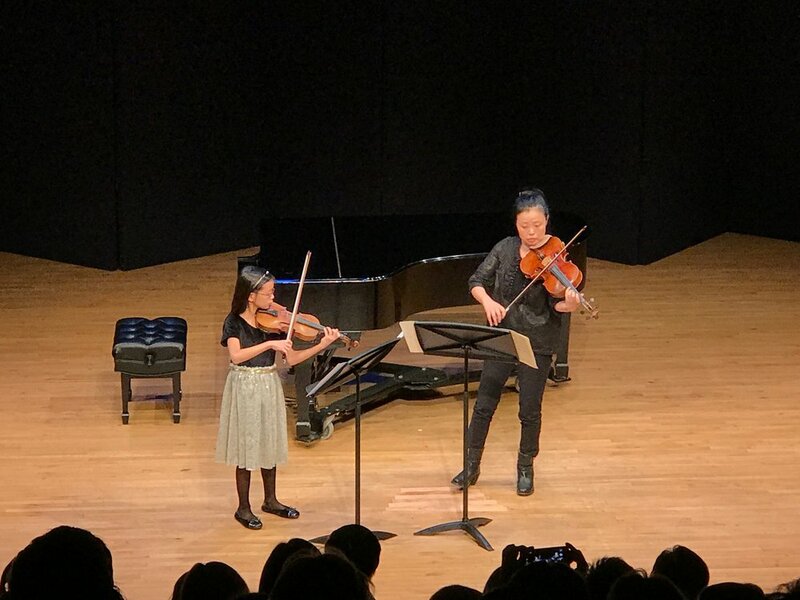 Participant Eugenia Lim and Vega violist Yinzi Kong perform Mozart's Duo in G, K. 423. Chamber Music is FUN! While an orchestra must follow the lead of a conductor, a chamber group encourages individuals to initiate their own music making. Each player in the group holds a unique piece of the musical puzzle and polishes it to the best of his or her ability. The team then figures out their way to put all the pieces together and bring the music to life. Members learn how to communicate, take responsibility and fulfill commitments through this process. The reward is a performance that the group can proudly call its own!